What Daily Performance Indicators should an Owner of a Plastics Processing Company Track? 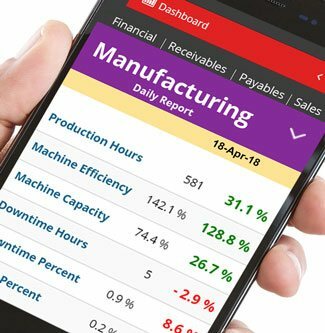 Dashboards provide executives with real-time, visually attractive and easily interpreted displays of critical information about the operation of the company and the plant. Commonly called Key Performance Indicators (KPIs), these measurements offer a high level but targeted view of the business – sales, products, operations, inventories, financials, etc. Designed primarily for top-level executives, dashboard KPIs can also be configured to focus in on particular parts of the business for mid-level executives and managers. The importance of KPIs and dashboards is that they make critical information available in an easy-to-interpret format. Further detail is readily available (drill-down) for analysis and decision-making. Let’s look at those two parameters: Critical information and Easy-to-interpret. This goes to the heart of measurement systems in general – you must measure those things that are important to the success of the business. Any other measurement, not aligned with company objectives, is likely to drive activities and decisions in the wrong direction. So dashboard KPIs must relate to corporate goals and performance in support of customer service (On-time Delivery, Production Profitability, Orders Booked and Shipped). Naturally, KPIs will differ based on the nature of the business being measured. A plastics’ manufacturer will be more concerned with the effective utilization of expensive plant and equipment resources (Production Capacity, Efficiency, and Downtime). Top-level executives in a plastics manufacturing company will certainly want to watch the same financial indicators that any other manufacturer watches – things like sales, profit, and return on investment. When it comes to operational measurements, the focus will be on meeting schedules, having the right inventories to support production and customer demand, and quality, among others. The KPI’s Dashboards are usually displayed using colors to indicate results and variances (green – all okay; yellow – a concern but not critical; red – immediate attention required to provide at-a-glance information and quick identification of anything that may need attention. The point is to quickly eliminate any concerns about aspects of the business that are performing properly and allow the executive to focus on where their attention is really needed without having to run multiple reports or even log into the business solutions software. focus quickly on the overall health of the business and where his or her attention is most needed – and can do best. Properly defined KPIs can provide early warning of developing situations and help companies prevent serious challenges by alerting decision-makers to the opportunities to avert a problem before it hurts customer service, sales or profit. Remember that there can be too much of a good thing and more is not always better. Having too many KPIs on your dashboard can not only stray from the main purpose – focusing on the critical aspects of the business – but can also distract the user’s attention away from those that really matter. Generally, five to seven measures each for Finance, Sales and Plant results are ideal and any more than seven or so will make the dashboard unwieldy and less useful.